Rosa: And when this is over, I'm going to find you, and I'm going to break those little fingers. Judge: Ms. Diaz, please stop threatening the stenographer! Jake: That hurt so bad. Let me know when he's gone so I can slide onto the nice, cool floor. Jake: I eat coffee grounds! Amy: Sure you do, pineapples. Rosa: Why do you care so much about some old reporter? Jake: Some old reporter? Is the sky just some big blue hat that the world wears? Rosa: No. And no one has ever thought that. Captain Holt: You look like a corpse we just pulled out of the river. Jake: Wrong. I look like a cool rock star who just OD'd in his own pool. Big difference. In the bull pen, Jake, Amy, Rosa, Boyle and Hitchcock guide the bomb disposal robot to Scully's smelly shoes as he naps. When the robot fails its task, they send Boyle in full protective gear to retrieve the odoriferous shoes. The squad then take Scully's shoes outside and blow them up with small-scale explosives. Unfortunately for them, that only spreads the noxious smell. When Amy, Rosa and Boyle arrive at work, they are surprised to find Jake is already there. 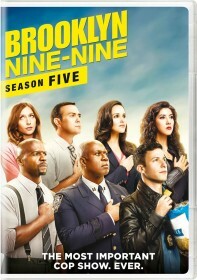 Jake is there early because an old crime reporter, Jimmy Brogan, who wrote the book that inspired Jake to become a cop, is there to write an article comparing the Nine-Nine's finest detectives to the "old school" characters in his book. Jake and Amy go to Captain Holt's office where he is meeting Jimmy Brogan. The Captain explains that Brogan will observe Jake and Amy on their Internet identity theft case. In the briefing room, Terry hosts a seminar with Boyle to try improve Rosa's court-room manners. Meanwhile, Amy explains her and Jake's identity theft case to Brogan. Jake starts smoking to impress Brogan, who has little interest in their modern tech case and subsequently falls asleep. Jake goes to Captain Holt to try jump to a more interesting case that an old school guy like Brogan might appreciate more. Holt says there is no "sweet mob-related homicide" on which to jump. Captain Holt wonders why Jake idolizes this guy, explaining the '70s were not a good time for the department as corruption, brutality and sexism were rampant. In such a time, Diaz and Santiago would never have made detective and an openly gay man like Captain Holt would never have been given a command. Jake insists the cops Brogan wrote about were great detectives and were legit. Captain Holt says some of them were legit, others were just Brogan's drinking heroes. Taking the wrong message from Captain Holt, Jake takes Brogan and Amy to a bar to drink. Jake enjoys hearing Brogan's old stories into the wee hours. Amy decides she's had enough and goes home, but Brogan's claim the old guard would drink 'till dawn keeps Jake there all night. The next day, Jake arrives at work hungover. Amy reads Jake some of the drunk texts he sent her overnight. Brogan arrives in fine form. Meanwhile, Rosa meets Terry and Boyle in the women's bathroom where they give her some new clothes to soften her wardrobe. After Jake asks for Scully's help dealing with a hangover, Amy makes him a raw egg drink to try cure his hangover. When the Captain says Jake looks awful, Jake denies this and downs this "protein" egg drink to prove he's fine. Despite his diminished state, Jake realizes the algorithm they used to try solve the identity theft case was wrong. After running the search with a new algorithm, they get a lead. Jake, Amy and Brogan go to the suspect's house to arrest him. After they see him climbing out of a window, they chase after him and Amy manages to tackle him to ground. When Brogan compliments Jake on being like an old-school cop, Jake asks if that's what's going to be in the article. Brogan assures Jake he'll come out looking good, especially after the good quotes Jake gave him about Captain Holt. Brogan says most cops are usually too afraid to go after their captains. In a court room, Rosa is called to the stand as Terry and Boyle watch on. With their advice ringing in her mind, Rosa gives a strange performance full of awkward, inappropriate smiling. Back at the precinct, Jake gets texts from Brogan with his quotes about Captain Holt. Jake is worried about the numerous slams he made against Captain Holt, especially since he now remembers telling Brogan he was going "on the record." Back at the court house, Rosa is angry at Terry and Boyle for making her look like a psycho on the stand. When Boyle figures out Rosa is nervous about the situation, he tells her he can help since that's where he lives. Boyle tells Rosa about the notion of a happy place where you go in your mind to get away from your fears. Jake meets up with Brogan at a space. Jake explains he doesn't want his quotes about Captain Holt printed, but Brogan insists he'll print them as Jake said he was going on the record. Jake claims Brogan got him drunk and took advantage of him, but Brogan isn't interested. Returning to the precinct, Jake explains to Amy that he punched Brogan in the face. Meanwhile, back on the stand, Rosa starts to get annoyed by the questioning. When Rosa suddenly calms down, Terry and Boyle are pleased to see that she's gone to her happy place. Back at the precinct, Captain Holt yells at Jake for punching Brogan. The Captain sends Jake home. Later, Holt congratulates Amy for catching the identity thief. When Amy tells Captain Holt that Jake deserves the credit, Holt admits he's sent Jake home. After Amy said that Brogan had it coming, she realizes Jake didn't tell Holt the real reason he punched Brogan. Captain Holt says he's disappointed that Santiago won't tell her the truth. Even though she knows he's manipulating her, Amy explains that Brogan agreed not to print the quotes. When Jake told Brogan that Holt was actually a really good cop, Brogan said Jake he didn't need to stick up for that "homo". That's when Jake punched him. When Rosa returns to the precinct, Terry congratulates her on her performance on the stand, which led to the accused being found guilty. After Rosa describes a disturbing happy place, Terry says he's going to go ahead and schedule her for a psych eval. To pay him back, Rosa invites Boyle to a thank-you dinner the next night, though she makes clear her boyfriend will be joining them. Amy reads Brogan's published article to Jake, who did not escape Brogan's criticism. Captain Holt tells them to ignore Brogan, who wouldn't know a legit cop if he punched him in the face. Outside the precinct, the squad blow up Jake's copy of Jimmy Brogan's book.